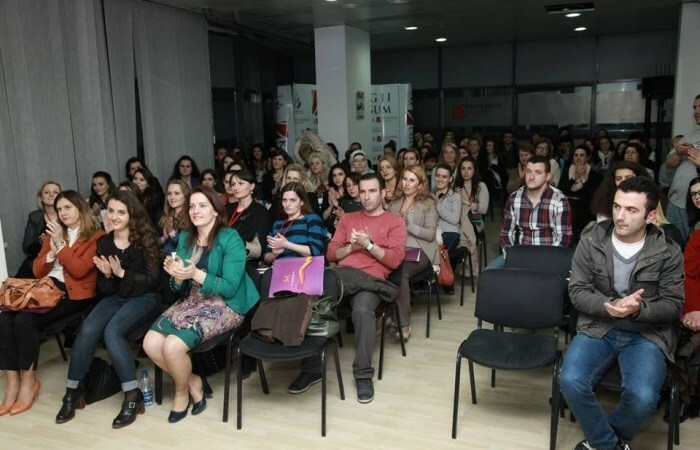 Organized within the Week of Women which is being held in Kosovo, as never seen before at BarCamp Prishtina, the 21st edition gathered in one place an audience dominated by women. This edition was organized together with National Institute for Democracy and was purely dedicated to women and her position in society. And obviously, all the speakers were females with interesting stories to tell. Zana Kurtishi Rudi, Kosovare Krasniqi and Blerta Thaçi were the guest speakers who gave inspirational speeches which grabbed attention of the audience. Being the coordinator of the BEP tech club in “Zekria Rexha” school in Gjakova has enabled her to be a role model for her students. She has managed to push kids to work hard and now her club offers services in hardware and software in school, supports teachers to lecture digitally, and manages and controls computers in all classes. Zana also presented to the audience the work that is being done to organize Girls in Technology Camp in Gjakova. “Each year we teach the basic stuff on how to get involved in our projects. We succeeded to win an award by Microsoft in the international competitions, which is a great inspiration for us to move forward”, she said. They have been working in Kosovo for years and now they are now enjoying the fruits of the hard work. Kosovare Krasniqi presented in the 21st edition of BarCamp Prishtina the success story of Athene and their role on empowering the role of women in Kosovo’s economic development. After speaking for the establishment of Innovation Centre Kosova, she continued with Wominnovation, a project concentrated on empowering the woman in society. “Wominnovation aims to increase women start-ups, to boost ambition of women entrepreneurs and inspire them to become business leaders. For four years now we’ve been very active and we recently released our latest product which is in the right path to be a success story” she said while explaining the work that Balkan Spring is doing in recent months. Balkan Spring is an online store which mainly target is to sell Kosovo’s products abroad. She is one of the role models for women in technology. Being young and female has never been considered as a weakness for Blerta Thaçi to achieve every goal she has set to herself. She was an inspiring speaker for all the women in the audience as she explained her long road of achievements. She started with her experience in StartUp Weekend and AppCamp Kosovo, two of major competitions which made her and her team to establish Appsix, a company where she is now working. FLOSSK and IPKO Foundation were also part of her speech as she explained the experiences which were mostly affective to her successful work. She is now working hard to establish a community of female coders.